I have discussed with my A2 class the end of the Gold Standard and the new era of self-regulating markets that started in the 1980’s under Reagan (US) and Thatcher (UK). 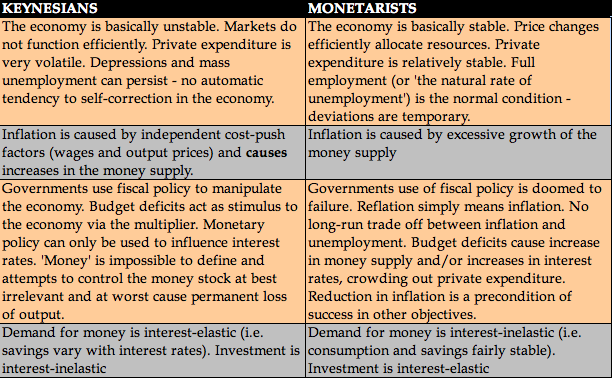 This relates to Unit 5 in the A2 syllabus – Main schools of thought on how the macroeconomy functions – Keynesian and monetarist. The Bretton Woods system was designed to improve the rules and practices of the liberal world economy which had grown up sporadically in the 19th century. However in 1971 the fixed exchange rate system collapsed (see post Fixed exchange rates and the end of the Gold Standard) and the full employment objective was cast aside. Futhermore controls on capital were removed in the 1990’s. The new system introduced was more free market based and took the name of the Washingotn Consensus System. According to Skidelsky the two regimes were shaped by two different philosophies. The Bretton Woods system broadly reflected the Keynesian view that an international economy needed strong political and institutional supports if it was to be acceptably stable. The Washington consensus was driven by free market principles of self-regulation and limited government intervention. This entry was posted in Exchange Rates, Fiscal Policy, Interest Rates and tagged Gold, Keynesian Policy on May 6, 2015 by Mark.